You find appropriate symbols to apply to features and graphics from the Symbol Selector dialog box. You can simply browse through the palette of symbols and pick one, or you can search for symbols. When you find one that you like, you can apply it as is or modify it first. You don't need to be familiar with the contents of all the styles on your computer or worry about which ones to reference to work with them. Searching automatically accesses them for you whether they are referenced or not. Alternatively, if you are limited to using only the symbols found in specific styles, you can reference the styles and limit your search to those only. Each symbol contains searchable tags that describe its graphic characteristics, such as its color or type. These tags can be modified in your own custom styles to describe any relevant aspect of the symbol, such as a related project, map, layer, scale, or specification. Search results consist of symbols where the search term matches either the symbol name, the symbol category, the style name that the symbol resides in, or the symbol tags. Search results include symbols that match the search term in name, category, style name, or tags. Search all styles: If you have a lot of design freedom when authoring your map, you will want to search with the All Styles option. This means that when you perform a search, you will get results from all the styles that are in the style path and any additional styles that your map document is currently referencing. By default, the style path is set to <install drive>:\Program Files\ArcGIS\Desktop<release number>\Styles, which is the location where the styles that are installed with ArcGIS are stored. You can add your own styles to this location to make them easily available for searching, or you can reference them instead. Alternatively, if you have a number of styles that you commonly use, you may want to point the Symbol Selector dialog box and symbol searching to a different style path instead. This will also change the list of styles that you see in the Style References dialog box. Manage the style path setting with the ArcMap Advanced Settings utility located at <install drive>:\Program Files\ArcGIS\Desktop<release number>\Utilities. 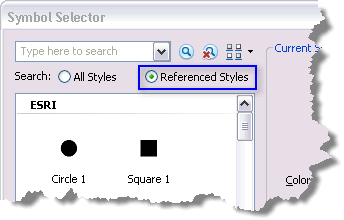 Search referenced styles only: If you are restricted to using only symbols from specific styles, you may want to search with the Referenced Styles option instead. This option limits search results to only those styles that are currently referenced in your map document. The first time you search for symbols after installing ArcGIS, the symbol index is built, and you will experience a short delay of a few moments. A message reading Updating Index Database will appear in the palette during this time. You are unlikely to see this message or experience this wait again unless you reference many large styles, change your style path, or make significant changes to the contents of currently referenced styles. 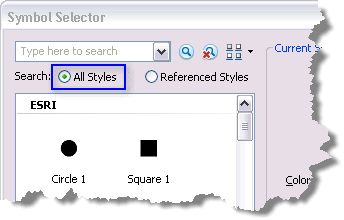 The palette in the Symbol Selector dialog box shows the results of a search query if one is present; otherwise, it shows all the marker, line, fill, or text symbols in the currently referenced styles. You can change the way you view this set of symbols. To see more symbols at once without scrolling, you can resize the Symbol Selector dialog box. You can arrange the way that symbols are organized in the Symbol Selector dialog box by grouping them by style or category. 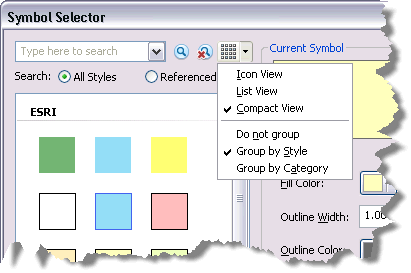 You can emphasize the appearance or the title of a symbol by choosing Icon view or List view, respectively. Use Compact view to show more symbols at once. The last 20 search strings are saved and can be reexecuted by clicking the down arrow on the Search box. Clicking the Clear Search button will remove the current search string from the Search box. The palette will then show all the available symbols in the currently referenced styles. To return useful search results, each symbol contains descriptive tags. Tags are strings that identify key information about each symbol. They can include references to the appearance of a symbol, its origin, its usage, or any combination of those. Tags can be up to 255 characters long, including spaces. 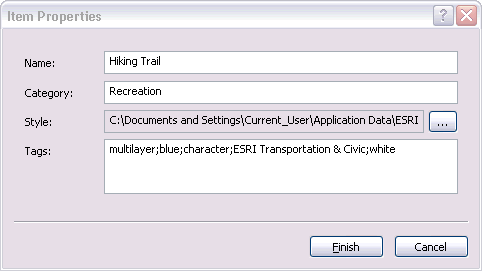 The styles that are installed with ArcGIS are read-only; they cannot be modified. The tags on the symbols in these styles are prepopulated to reflect the graphic properties of the symbols, such as the primary color, the symbol type, and perhaps the font that it is built from if it is a character marker. 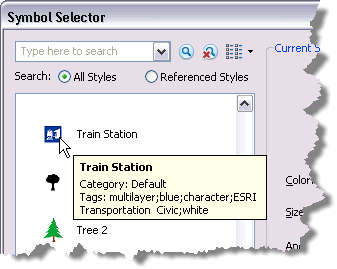 When a custom style created prior to ArcGIS 10 is referenced, the Tags field is automatically populated for marker, line, fill, and text symbols. These tags can be modified if necessary in the detailed view of the Style Manager dialog box. When new symbols are saved to a style, the tags are repopulated and can be modified. What are symbols and styles?